Franke is a leading provider of products and solutions for residential kitchens and bathrooms, professional food service, coffee preparation and semi-/public washrooms. Founded in Rorschach, Switzerland by Hermann Franke in 1911, Franke has spent more than a century building a world-renowned reputation for high-quality products – all manufactured at the company’s in-house facilities. 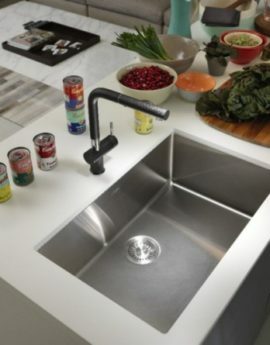 As the world’s largest kitchen sink manufacturer, Franke has developed a product that resonates with consumers. With this wide array of solutions, you will build your dream space with high quality, durable, and hygienic materials. From practical sink grids to specially treaded cutting boards and colanders, every Franke product is made to interact seamlessly with its sinks, your kitchen, and most importantly, you. Never has a kitchen solution made more sense. It's easy to be ordinary. But ordinary is not what we want to do at Franke. We want to make everything we do wonderful.